Do you love Italian wine & food? Eat & drink like an Italian! Share in a delectable journey of more than 80 wines from 23 producers and the perfectly paired regional cuisine of Pazzaluna! Learn about the wines from the producers themselves while you taste and enjoy. This grand wine tasting begins at 12:00pm and runs until 3:00pm and comes with a commemorative glass to take home. Sunday, May 5th, 5:30pm - $75 per person - Make reservations by calling 651.223.7000. 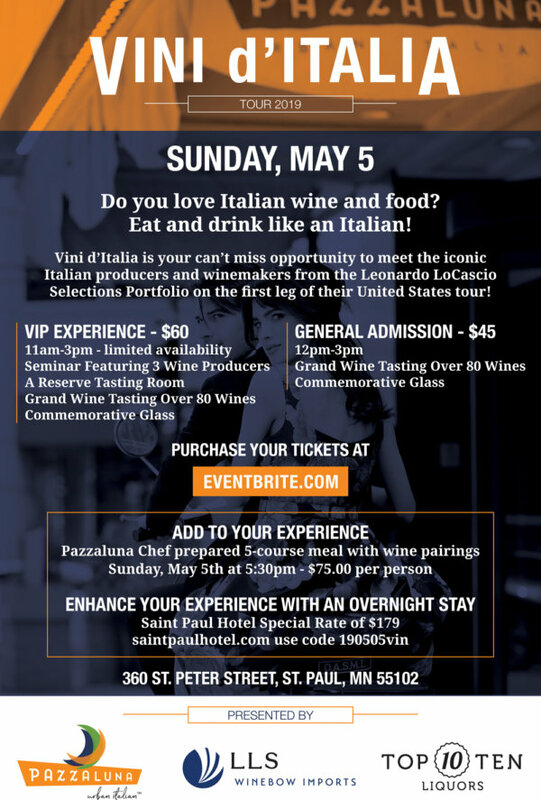 Reserve online at saintpaulhotel.com, use code 190505vin.